Star Trek Into Darkness is the best film of the entire Star Trek film series date and if it's not then it definitely rivals Star Trek II: The Wrath of Khan for the honor. Yeah. I said it. I went there. In 2009 J.J. Abrams and his gang at Bad Robot delivered Star Trek and pulled off the impossible: they made the world care about Star Trek again. They did it by yanking out of our minds the tired and tedious Star Trek we had grown inured to, then shattered it into a hundred pieces on the floor without seeming to give a damn about how those pieces would fit back together... if they weren't totally thrown out and forgotten about first. 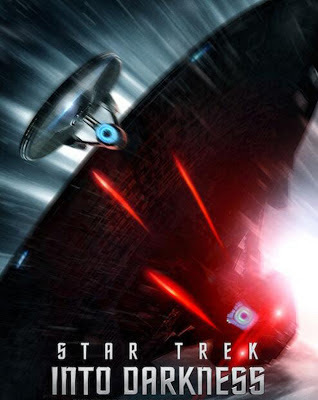 Star Trek 2009 was easily one of the most beautiful and well-engineered pieces of blockbuster cinema of the past two decades. Four years after writing my review and I still find myself overwhelmed by its beautifully orchestrated destruction of the familiar. The classic Trek? It's still out there and one of Star Trek '09's more genius tricks was using quantum theories to give us an alternate reality that is not a replacement for the classic Trek canon, but rather an extension of it. A complement of it, even. So... could J.J. Abrams and the writing team of Roberto Orci, Alex Kurtzman and Damon Lindelof give us a solid follow-up? Having seen it twice now, Star Trek Into Darkness is a sequel that not only stands well on its own, it actually makes the previous film better. Abrams and his peeps could choose not to make another Star Trek movie after this one, and I would be happy, because Into Darkness ends on precisely the right note that it needs to be. Star Trek Into Darkness opens some time following the events of 2009's Star Trek and hits the ground running with a cold open that makes a few sly winks at Raiders of the Lost Ark. James T. Kirk (Chris Pine) has taken the Enterprise to an undeveloped planet whose aborigines have barely invented the wheel. Unfortunately this lil' "observe and report" mission gets complicated by a supervolcano whose imminent eruption threatens to destroy the planet and wipe out the natives. Kirk doesn't want that to happen so he has Spock (Zachary Quinto) whip up a gadget to save the world (this world, anyway). In the course of events, Kirk winds up saving Spock's life. But no good deed goes unpunished. Particularly when it involves the Prime Directive. Kirk gets called onto the carpet by Admiral Pike (Bruce Greenwood, who seems to be enjoying a lot of good work lately). Pike asserts that Kirk doesn't understand what it means to be in the captain's chair: he's taking risks but not thinking about the consequences. Playing games with people's lives, then patting himself on the back because nobody has been killed on his watch. In short: Kirk may have an inkling of life but he hasn't faced up to the reality of death. Witness here the real secret of Star Trek Into Darkness' success: how much it judiciously draws from the well of The Wrath of Khan. This is the first time. It won't be the last. Pike yanks the Enterprise from Kirk. Meanwhile in Great Britain, a Starfleet officer and desperate father (Noel Clarke, known to many as Mickey from Doctor Who) is approached by a sinister individual offering a cure for his daughter's illness. The girl survives, and her father owns up to his end of the bargain by suicide bombing a secret Starfleet installation in the heart of London. Because this is a timeline which is still reeling from the attack on the U.S.S. Kelvin a quarter-century earlier. When Nero and his ship came through time, that one incident triggered an entire cascade of events which altered history in ways both drastic and subtle. As a result many in Starfleet such as Admiral Alexander Marcus (powerfully played by Peter Weller) have come to see the Federation as being too weak militarily. Where Starfleet was supposed to be about peace and exploration, some now want it to be about war and conquest. Nero's destruction of Vulcan in Star Trek moved Starfleet's more aggressive elements to take action. And it is eventually discovered that at the heart of Marcus' covert buildup is a twentieth-century warlord found floating in deep space along with seventy-two of his followers: Khan Noonien Singh. This is going to draw some flack, but I'm going to put it in writing: Benedict Cumberbatch as Khan is the best villain I've seen in a movie in years. And I will go so far as to say that his Khan is more evil, more dangerous, and more fascinating to behold than was Heath Ledger's Joker in The Dark Knight. Cumberbatch's Khan is also the most sympathetic villain we have seen in a very long time. Yes, he's killing people left and right and he is capable of bringing the Federation to its knees. But as the story progresses we find that for Khan, he really doesn't have much of a choice in the matter. What he is doing is not from a lust for power, or territory, or even revenge and obsession. He is only interested in protecting and taking care of his people. I watched the "Space Seed" episode from the original television series after seeing Star Trek Into Darkness and... it's just impossible not to associate Cumberbatch's take on Khan with Ricardo Montalban's portrayal. In this reviewer's mind they are 100% one and the same. We are seeing the very same character, the exact same person... but we are seeing what that person is doing with his back against the wall and left to fend for himself. The result: Khan Noonien Singh finally afforded the latitude to demonstrate his superior intellect and enhanced physical ability. This is the Khan that could have been were it not for the disaster on Ceti Alpha V... and he is an astounding character to witness! But as gripping and compelling as Cumberbatch is as Khan, I felt that he was but part of the larger drama at work in Star Trek Into Darkness: how we the viewers behold the Federation turning into a twisted version of the one we know from the original series. It's not the "Mirror, Mirror" universe wracked with backstabbing and treachery, but it is one that is increasingly turning to faith in firepower as oppose to hope in the heart. Some people have written that this movie has its title because J.J. Abrams wanted everything in it to be "dark dark dark". But that's not really why at all. It's called Star Trek Into Darkness for a very good reason: this is the Star Trek we've come to know and love... slipping into darkness. For Kirk and his crew, this isn't about saving the Federation from Khan or the Klingons: this is about saving the Federation from becoming its own worst enemy. The real baddie of Star Trek Into Darkness is Admiral Marcus, but the true conflict is the one against fear. Star Trek II: The Wrath of Khan became a classic parable about growing older and having to face death. Star Trek Into Darkness is a morality tale about facing life, and being able to live with yourself. I don't know if that was the intention of Orci, Kurtzman and Lindelof when they wrote this script but I suspect it's not without reason why they chose to borrow so liberally from The Wrath of Khan. I enjoyed once again watching Chris Pine and Zachary Quinto as Kirk and Spock, respectively. Zoe Saldana as Uhura impressed me much more in this film than she did in the previous entry (she gets some great screen time during the scene with the Klingons). Simon Pegg continues to be a hoot to watch as Scotty! However if I have one complaint it was that there wasn't enough of him in this movie, and shuffling him and Keenser (Deep Roy) off to get drunk in a bar in San Francisco - as fun as that was - doesn't nearly enough make up for it. Ditto for John Cho as Sulu and Anton Yelchin as Chekov: apart from Sulu taking the helm and Chekov's brief tenure as ship's engineer, I barely remember them for much else. Karl Urban however continues to rock it as Dr. McCoy! It was seriously spooky how much he seemed to be channeling DeForest Kelly's spirit in Star Trek, and Urban just amps it up more here (he gets the best line of the whole dang movie, in my opinion). Again however, I wanted to see more of him. Michael Giacchino turned in another terrific score for this movie's soundtrack. There's a lot of variety in the music for Star Trek Into Darkness. Some of it is even considerably quieter than much of what one would have expected from any Star Trek production. Khan's theme is an especially stirring composition: evoking the Khan we saw in "Space Seed", compounded by Khan's circumstances in the alternate reality... along with a healthy hint of James Horner's theme for the character from The Wrath of Khan. I would be remiss in my duty as a movie reviewer if I did not mention how much of a delight it was to see Leonard Nimoy return as Spock from the original reality. Some have thought that his cameo was not necessary. I thought it was perfect to have the original Spock bring that kind of connection to this story. It was not a long scene, but Nimoy's performance in it has stuck with me. Especially that haunted look he acquires as he begins to tell his counterpart about Khan Noonien Singh. Excellent review Chris! BEST FILM OF THE YEAR SO FAR!! Everyone should see it...fan of the series or not. It's just a quality movie that very entertaining. And Cumberbatch should get some serious consideration come awards season. He's that good.